Decorative concrete has many uses both inside and outside a home or commercial space. There are limitless possibilities when creating a masterpiece using this versatile medium. Custom concrete creations can be fitted to a home or business owner’s purpose and taste. In a world where most everything is mass-produced, these designs can give any space its own personality. Fireplaces and water features are two elements of a home or business that have the potential to become a centerpiece instead of being considered as a functional background. Adding a unique twist to these installations by decorating them with custom designed concrete can liven up an otherwise dull room. A fireplace has the ability to either make or break the ambiance in a room. Due to its function, it is almost always located at the center of a space, making it very conspicuous. Have the fireplace designed in a way that it brings out your personality. Using custom concrete designs can make it an instant conversation topic when you have guests over, and the charm of having a unique fireplace surround leaves an impression of being elegant. The options are endless since decorative concrete can be used to create both simple yet classy structures and bold and elaborate details. At JM Lifestyles, we can recommend fireplace designs and help you put a personal touch on yours by using our vast experience with custom concrete creations. Water features can also be an excellent way to showcase your style and taste. If you aim for a natural-looking space, we create concrete rockwork that looks authentic. 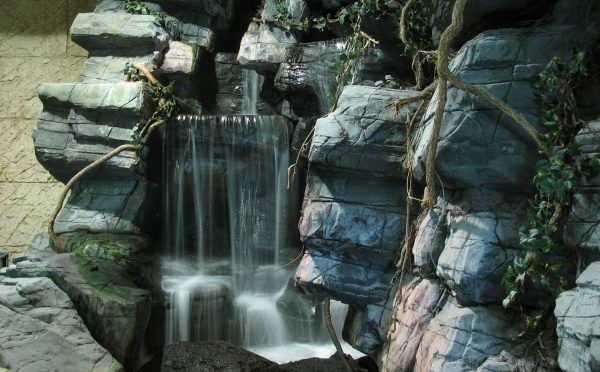 We can adapt our work to include cascading waterfalls, rockscapes that line pools, streams of water in a pond, and natural-looking aquariums. With our experienced team, every water feature can be customized into a work of art.